Our aim is to provide the community of Henleaze and beyond wiith a wide range of great tasting meat and poultry, produced to the highest standards of animal welfare, sourced as locally as possible and prepared by our master butchers to your requirements. Our staff are keen to help on cooking ideas and love their food too! We are also happy to source more unusual meats. Pies, sausages and burgers and gluten free products are made using quality fresh free range ingredients and have received many prizes over the years. We offer no gimmicks! Buy only as much as you need, locally made and at a sensible price with real taste and integrity! 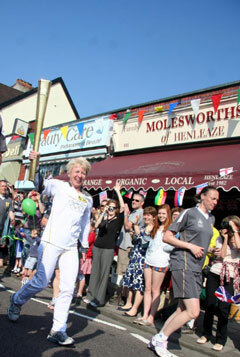 The business combines over 100 years of service and is the combination of the former well established Henleaze Quality Butchers and award winning butchers R.K. Palfrey of Newport, acquired by the Molesworth family in 2002. Peter Molesworth has a background in Organic Farming and food, and his family are involved in the development of the business. This combination plus experienced butchers allows us to bring you great choice, quality and value. The Salt marsh lamb season has arrived! All the lamb that we sell, up until around November will be the famous Salt Marsh Lamb. Come in and try some, whether it be some lamb chops, a leg of lamb, mini joint or a lamb burger. Free Samphire in season. 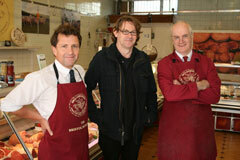 Nigel Slater (Food Writer) fliming on location at Molesworth's with Peter and Graham. 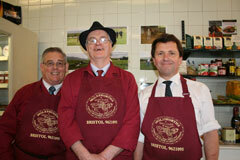 Molesworths team: Richard, Graham and Peter. If work or distance make it difficult for you to visit us personally, then why not take advantage of our delivery service. We deliver nationally by next day courier, or locally in person. You can email or call us to discuss options.